No umbrella, but you get the picture. 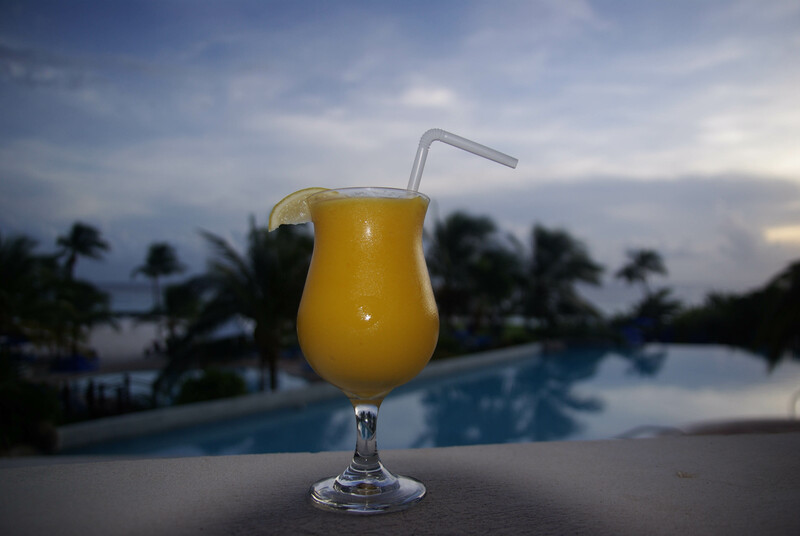 Me, a swim-up bar at sunset, and a mango daiquiri. See the beads of condensation on the glass? It’s cold, which is what you want when it’s 32C in the sun. It also has that balance of tart and sweet that I love. I’m sorry, margarita, but sometimes a gal needs to order something girlier — and a wee bit sweeter — at the swim-up bar. Blend ingredients together in a blender. Pour into a hurricane glass, garnish with a mini umbrella and serve. This entry was posted in Cocktails and tagged cocktails & drinks, daiquiri recipes, Drink of the Week, mango daiquiri. Bookmark the permalink. Lisa Kadane is a Calgary, Canada-based features writer. A former and aspiring world traveller and skier, she now has two little kids and can therefore shake a really strong but well-balanced margarita. I wore Birkenstocks in Paris -- quelle horreur! Sad to see you go!